The forecast was a mixed bag for Saturday with heavy isolated showers giving way to more settled conditions in the afternoon. It rained hard till midday then started to ease and by the time the first of 32 yachts started racing from the FSC line it was clearing through. 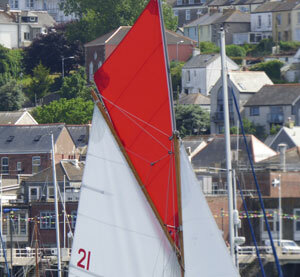 Q class were first away with Minx, Charles Choak getting a good start. The wind was South West, which gave a starboard pole spinnaker hoist on the line. General Khaos, Ian Jakeways took off and Tai Mo Shan, Neil Chamberlain made good efforts single-handed. Five minutes later at 1400 hrs U class went, Wilkie, Bob Chapple, electing a clubhouse end start while Trifle, Chris Jelliss and Kaimana, Nigel and Jess Rowe came off the middle. 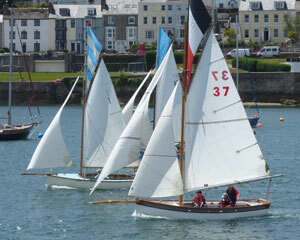 The two Hawks, Ida, Mike Swingler and Mr G, Tim Dewhurst followed close behind. U class were destined for Water Tower to port and the boats had to gybe in order to make the mark, as the ebb tide was strong. Wilkie forged ahead with Trifle close on her heels. W class went off at 1405 hrs and Sweet Friday, Len Cheshire led away from Amneris, Mike Robson. At 1415 4 G class Gaffers went off with Katy, Sue Grigg taking an early lead. Fifteen B and C class Working Boats were started at 1435 off the Frigate buoy by the Vice Commodore John Maunder. They made a resplendent sight with their huge rigs and brightly coloured topsails painting the dull grey of the docks. The wind although steady in its strength was sometimes fickle in its direction as towering Cumulus clouds and updraughts disturbed the flow. After Water Tower in U class we had a short beat to Sunbeam and seemed to be making up to weather of Wilkie who just shot the buoy and rounded ahead of us. We got a massive header and like Kiamana behind us we had to put in a short tack for the buoy. We set a starboard pole kite and set for Water Tower again chasing Wilkie who had increased her lead. We got mixed up with some G class who were rounding the same mark! A gybe onto port pole saw us take the mark and head for St Just which duly rounded gave a long beat back to the club line. Wilkie went further ahead but got caught in a massive header going up the harbour but we had a massive lift and came to within 4 boat lengths of her. The turning mark was rounded and we headed back toward St Just for another round. The spinnaker was windward launched and got snagged, Finn Richards duly sorted it out and soon we were neck and neck with Wilkie as the wind lifted both boats into gybing. As usual it went the other way and we gybed back again. Wilkie pulled away. Kaimana behind just sailed through the shifts and kept going. We caught Wilkie up and traded tack for tack up the harbour. A ferry loaded with smiley passengers unaware of the danger missed us by two feet, only because I tacked and that gave us the edge to Wilkie who just overhauled us to take the line. Trifle won by 54 seconds on handicap! Close racing indeed!! 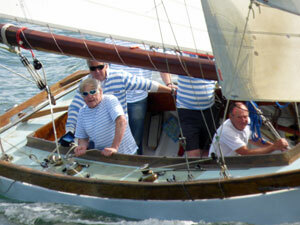 Katy, won the gaffers beating Clementine, Alan Perham and Miss Agnes, Mike Rangecroft. G class were competing for the William and Mary Cup. General Khaos beat Minx in Q class with solo sailor Neil in Tai Mo Shan 3rd. Thanks to Cockwells our sponsor and Sue Swingler for great teas. Jeannette for clear radio calls and Robin Roebuck and team for Race Officer duties assisted by Paul and John. Thanks to Giles the boatman for delivering us safely. Commiserations to him as “Puddles” the duck got eaten by a sea rat seagull! 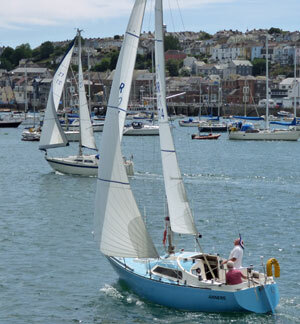 Next weekend, Falmouth Tyres sponsors the Flushing Fowey Flushing race for QUW classes and for the rest there is the Falmouth Classics. But I am going camping in the wobble box! See you again on Saturday 25th. *In the handbook the dates of the Grace and Gebhard trophy race, and the Royal Standard and Feety Speers cups race were transposed. Apologies to anyone who went to the wrong pub as a result!